Yeah, so, partial bedrest is apparently really good for knitting productivity, because I have knit more finished objects in the last month alone than maybe the entire last year, mostly while lounging sideways on the couch watching Marvel: Agents of S.H.I.E.L.D., Black Mirror and Parks & Recreation with the husband. 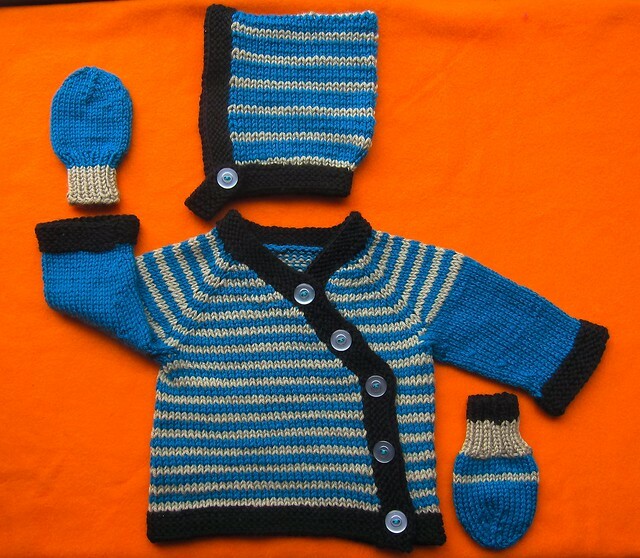 Above is the latest finished knit set for Baby Torchwood, and I think it's my favorite so far. Because, well: stripes! Plus I love the kimono-style closure and contrast bands. Patterns: The Gift Wrap Sweater and Gift Wrap Bonnet by Carina Spencer (purchased as the Gift Wrap Collection ebook set as I originally intended to make the Gift Wrap Romper but didn't have enough yarn)... plus the free Wee Baby Newborn Mitts pattern by Christine Vogel. Yarn: 3 colors (4 balls total) of Debbie Bliss Cashmerino Aran yarn, a lovely, squishy, soft and washable merino wool/microfiber/cashmere blend. I bought these on impulse while shopping for buttons at one of my favorite local Brooklyn yarn stores, La Casita Yarn Shop Café. They didn't have enough of the blue for an entire sweater (just two balls), but these three colors seemed harmonious, and rather TARDISy/Whovian to me. 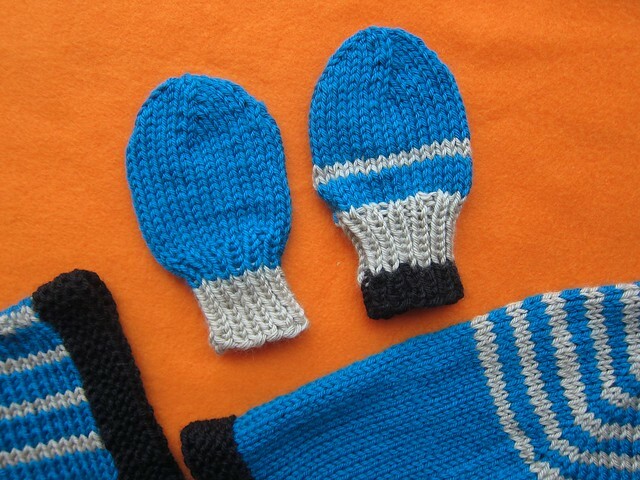 I had a few little bits left over when the sweater and hat were done, so decided to squeeze out a pair of matching thumbless mittens as well. Needles: The Gift Wrap patterns recommends size 8 and 6 needles, but I got gauge with sizes 4 and 3 for the sweater, and 4 and 2 for the hat. (I knit super loosely, though.) I used size 4 and 2 on the mitts. Size: I made the 6-month size in the sweater, toddler size in the hat, and although the mitts are supposed to be newborn size, I used aran weight instead of DK weight, so they're more 6-month or toddler-size. I do think baby will be able to wear all the coordinating pieces at once. Notions: The 3/4" buttons (sewed on INCREDIBLY tightly and securely, please don't worry!) were an Etsy find, just $2.55 for a pack of 50 in various iridescent shades from SkeeterBitz. 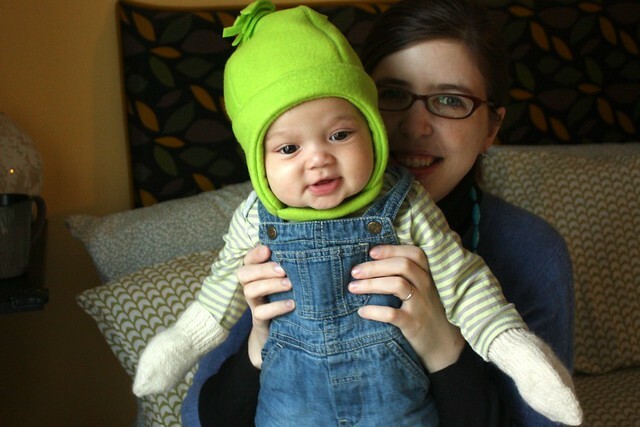 Raveled: Sweater, bonnet and mitts. The sweater took about two weeks of sporadic knitting, and the hat and mitts were both done in less than a day each. The sweater pattern has striped and non-striped options, as well as a contrast band. It's super simple to make, knit all in one piece from the top down, and the sleeves picked up later. I didn't have quite enough gray to stripe the sleeves, but I think the solid sleeves are a nice "design feature." I do hope you're not all getting super sick of baby stuff around here... I really do plan to sew grown-up lady clothes again once my waist returns, but I don't really know yet what size I'm going to end up, and there is no point in making maternity clothes at 38 weeks along, now is there? This is utterly adorable. Terrific!